There's a few things I really like about our trip so far, one is the stunning views and the other is the satisfaction of completing new tasks successfully. Both have been a huge part of the last few weeks! 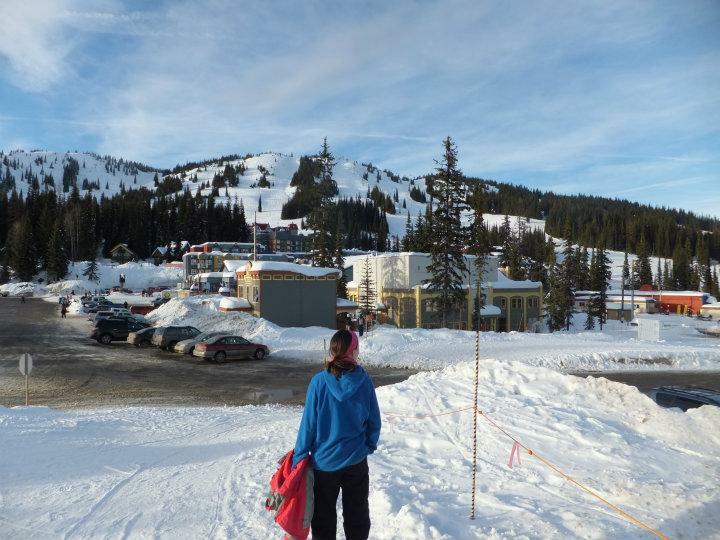 On Friday 14th we spent the day travelling to Silver Star, a popular ski resort where we wanted to try some snow sports. I planned to try snowboarding (it just seems "cool") but Abi planned on Ski-ing. For the three weeks previous to this excursion I had been trying to convince Abi to try snowsports to which she had been less than enthusiastic and worried there may be broken legs early on in our adventure. Because she had taken a leap of faith and decided to try something new despite her reservations I somehow gave in to her request to ski over snowboard....oh was this a big mistake!! Now don't get me wrong, I loved Ski-ing, but I was not prepared for the onslaught of awkward positions and tension my body was about to take! We paid for a 2 hour session to get into ski-ing with a bit of guidance with a great instructor who had a lost of experience, he hadn't met someone like me though! First thing first we went through a few basic drills and techniques before heading down the small practice slope, I being confident in my abilities decided to go first and dive down the hill. The problem was I hadn't learnt to stop...the fence felt my pain too! Abi proceeded this by gracefully and in full control easing herself down the hill in the correct position. Over the next hour the instructor spent most of his time in front of me trying to prevent my flying off into an unknown abyss beyond us while Abi guided herself down the hill repeatedly controlled and safe. In order to speed up the session the instructor showed Abi turns, which again she executed with absolute ease and control while I began to turn each time well, but ended up flying forward (a couple more bumps followed). In frustration (or maybe desperation) the instructor took us to the larger hill (remember, I still hadn't mastered stopping!). This was me in my element, I loved the speed so flung myself down the hill, by now able to twist and turn to the left only. Lucky for me as I unceremoniously hurtled down the hill, left was the only way to go. Even on the second hill Abi continued to show the instructor a controlled ski at very slow speeds as she wound her way down and climbed onto the escalator to rise for another attempt. This is where the instructor left us having shown Abi the basics and watching me fly down enthusiastically without a full grasp of how to stop. Lunch was painful. I took off my boots to realise my leg muscles had been made to hold in positions my flexibility should't have allowed and they made sure I knew it. At this point Abi described her version of the days events so far which were considerably different to mine, to me she was slow and controlled, to her she was just too nervous to go any faster! After a gorgeous steak lunch we reluctantly got back on the snow reverting to the small practice hill again for comfort. We both pushed through pain in our legs and got back on the snow. Just 10 minutes without the instructor and we both became more confident, quick turns, better stopping and more control. We moved to the bigger hill and began enjoying the experience a lot more. All in all the afternoon turned out really enjoyable, if not still a little painful. Ski-ing gets a thumbs up from Kieran, but a "hmmm" from Abi who didn't quite overcome her worry about high speeds.